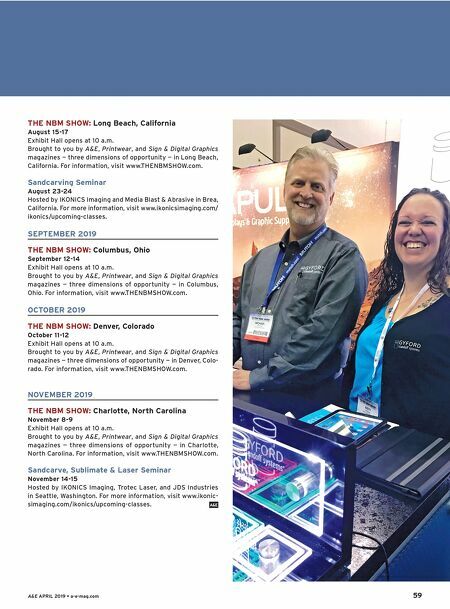 58 a-e-mag.com • A&E APRIL 2019 Calendar Upcoming Events APRIL 2019 FlexiSIGN & Color Management Workshop April 4-5 Hosted by Mutoh America in San Francisco, California. For more information, visit www.thinkmutoh.com/event. Sandcarving Seminar April 12-13 April 12: 1–5 p.m.; April 13: 9 a.m.–5 p.m. Hosted by IKONICS Imaging and Media Blast Abrasive in Brea, California. For more information, visit www.ikonicsimaging.com/ ikonics/upcoming-classes. CorelDRAW Basics April 19 Hosted by Fairway Laser Systems in Valparaiso, Indiana. For more information, visit www.fairwaylaser.com/book-online. MAY 2019 Sandcarving Workshop May 9-10 May 9: 12–5 p.m.; May 10: 8:30 a.m.–5 p.m. Hosted by Rayzist in Vista, California. For more information, visit www.rayzist.com. FlexiSIGN & Color Management Workshop May 9-10 Hosted by Mutoh America in Chicago, Illinois. For more informa- tion, visit www.thinkmutoh.com/event. Images in Glass Workshop – Fusing May 11-12 9:30 a.m.–4:30 p.m. Hosted by Rayzist and Fire Fusion Studio; day one: Vista, Cali- fornia, day two: San Marco, California. For more information, visit www.rayzist.com. THE NBM SHOW: Milwaukee, Wisconsin May 17-18 Exhibit Hall opens at 10 a.m. Brought to you by A&E, Printwear, and Sign & Digital Graphics magazines — three dimensions of opportunity — in Milwaukee, Wisconsin. For information, visit www.THENBMSHOW.com. Advanced CorelDRAW May 17 Hosted by Fairway Laser Systems in Valparaiso, Indiana. For more information, visit www.fairwaylaser.com/book-online. FlexiSIGN & Color Management Workshop May 23-24 Hosted by Mutoh America in Denver, Colorado. For more informa- tion, visit www.thinkmutoh.com/event. 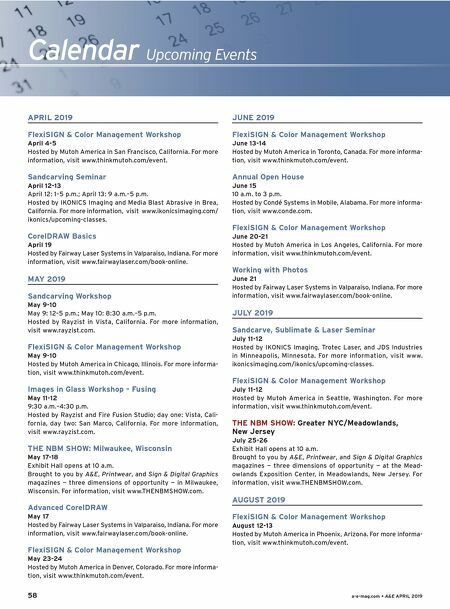 JUNE 2019 FlexiSIGN & Color Management Workshop June 13-14 Hosted by Mutoh America in Toronto, Canada. For more informa- tion, visit www.thinkmutoh.com/event. Annual Open House June 15 10 a.m. to 3 p.m. Hosted by Condé Systems in Mobile, Alabama. For more informa- tion, visit www.conde.com. FlexiSIGN & Color Management Workshop June 20-21 Hosted by Mutoh America in Los Angeles, California. For more information, visit www.thinkmutoh.com/event. Working with Photos June 21 Hosted by Fairway Laser Systems in Valparaiso, Indiana. For more information, visit www.fairwaylaser.com/book-online. JULY 2019 Sandcarve, Sublimate & Laser Seminar July 11-12 Hosted by IKONICS Imaging, Trotec Laser, and JDS Industries in Minneapolis, Minnesota. For more information, visit www. ikonicsimaging.com/ikonics/upcoming-classes. FlexiSIGN & Color Management Workshop July 11-12 Hosted by Mutoh America in Seattle, Washington. For more information, visit www.thinkmutoh.com/event. THE NBM SHOW: Greater NYC/Meadowlands, New Jersey July 25-26 Exhibit Hall opens at 10 a.m. Brought to you by A&E, Printwear, and Sign & Digital Graphics magazines — three dimensions of opportunity — at the Mead- owlands Exposition Center, in Meadowlands, New Jersey. For information, visit www.THENBMSHOW.com. AUGUST 2019 FlexiSIGN & Color Management Workshop August 12-13 Hosted by Mutoh America in Phoenix, Arizona. For more informa- tion, visit www.thinkmutoh.com/event.